The Rogers Cup is coming to Toronto! 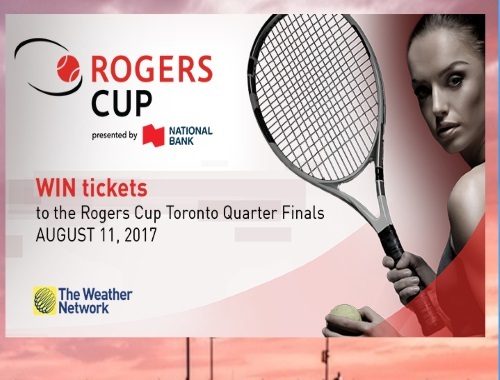 Win tickets to the Rogers Cup Toronto Quarter Finales ($1000 value) on August 11, 2017 from The Weather Network. Grand Prize. Canada (excluding Quebec): Two tickets to the Rogers Cup Quarter Finals Friday, August 11, 2017 in the Infiniti VIP Lounge and 1 parking pass. Secondary Prize. Canada (excluding Quebec): Two tickets to the Rogers Cup 1st Round Monday, August 7, 2017 in the Infiniti VIP Lounge and 1 parking pass. Secondary Prize. Canada (excluding Quebec): Two tickets to the Rogers Cup 1st Round Tuesday, August 8, 2017 in the Infiniti VIP Lounge and 1 parking pass. Secondary Prize. Canada (excluding Quebec): Two tickets to the Rogers Cup 2nd Round Wednesday, August 9, 2017 in the Infiniti VIP Lounge and 1 parking pass. Secondary Prize. Canada (excluding Quebec): Two tickets to the Rogers Cup 3rd Round Thursday, August 10, 2017 in the Infiniti VIP Lounge and 1 parking pass. Contest closes August 9, 2017. Quebec is excluded. Enter below and come back every day until August 9 for your chance to win!